Despite the model name, the EOS M10 was, on launch, only the manufacturer’s third compact system camera to hit the UK market; somewhat surprisingly so, as rivals had been offering similar since 2009. Fortunately it also arrived at an entry-level price to enable it to compete. Not to be confused with Olympus’ own competing OM-D E-M10 and its various iterations, the interchangeable-lens EOS M10 is the entry-level alternative to Canon’s own EOS M3, and on its inception was more obviously targeted at those stepping up from using a smartphone for photo and video capture. Both relatively compact and lightweight, the specification is very respectable given its ‘starter' status. For example the M10 incorporates an 18MP APS-C CMOS sensor, 49-point AF system, DIGIC 6 generation processor, and deftly captures Full HD video at a frame rate just shy of 30fps. Added to this, built-in Wi-Fi and NFC connectivity will make for an easy transition from mobile device to a dedicated camera, for former smartphone photographers. Mobile users will also find much about the M10’s touchscreen that's intuitive, such as touch AF and full creative exposure control. The clear 1,040K-dot resolution monitor can also be flipped up through 180° for those ubiquitous selfies. Low-light work is also enhanced via manually selectable light sensitivity settings up to ISO 12800, which is further expandable to an ISO 25,600-equivalent setting on this model. Though this is an entry-level model we also get the option to shoot in a Raw file format as well as standard JPEG (capturing them simultaneously or separately). This is something that further differentiates it from the smartphone brigade, as is the opportunity to swap the lens in use. There weren’t that many lenses directly compatible with the camera’s EF-M mount when the M10 was originally announced, though that is rapidly changing. In addition, there is the advantage of access to Canon’s much, much wider lens range for DSLRs if buying an optional adapter. Alternatively simply go for a kit-lens option when buying the EOS M10, such as a bundle that comes with a 15-45mm f/3.5-6.3 IS STM compact zoom. 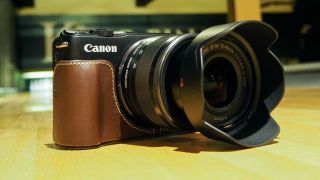 Look out also for the subsequently launched Canon EOS M100, if your pennies can stretch to the newer model.